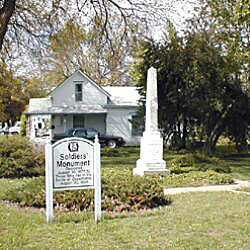 Description: A Granite monument and cannon are located with a flagpole. 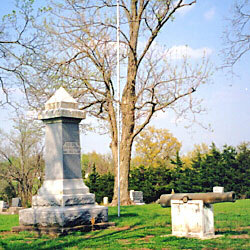 The monument is inscribed: "Erected ~ 1912, ~ To The Memory ~ Of The ~ Union Soldiers ~ of 1861 - 1865" and "One God ~ One Country ~ One Flag". A small separate marker is inscribed: "252 G.A.R." The cannon is a Napoleon field gun, mounted on a concrete base. The cannon was installed in 1912 at the same time as the monument. 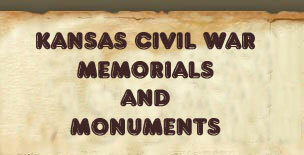 Description: Battlefield purchased and presented to the state of Kansas by the Woman's Relief Corps of Kansas. 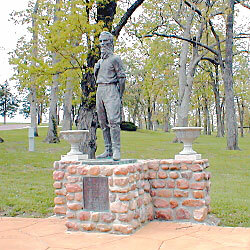 On May 13, 1909, John Brown's battle field at Osawatomie was purchased and presented to the state of Kansas. 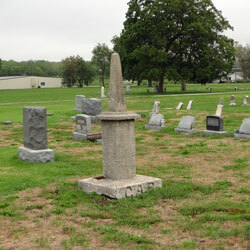 The Woman's Relief Corps of Kansas purchased the tract for $1800, of which $1500 was raised among members and the remainder pledged from the state department funds. The address was delivered by Mrs. Anna Heacock, of Parsons, retiring state president. State Senator F. H. Stannard represented Governor Stubbs and presented Prof. Wm. Wheeler, an early-day educator, to make the speech of acceptance. 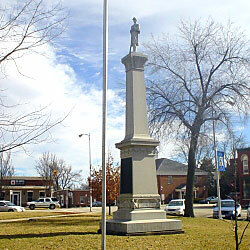 The monument, dedicated August 30, 1877, reads "In Commemoration Of Those Who On The 30th Of August, 1856, Gave Up Their Lives At The Battle Of Osawatomie In Defense Of Freedom" and "In Commemoration Of Capt. John Brown, Who Commanded The Battle Of Osawatomie, August 30, 1856, Who Died On The Scaffold At Charleston Virginia, December 2, 1859". Description: A bronze plaque is mounted on a granite Monument in front of John Brown's Cabin at the Battlefield site. The inscription reads: "John Brown BattleGround ~ Purchased By Department Of Kansas ~ Womans Relief Corps ~ Dedicated To The ~ Grand Army Of The Republic ~ Presented To The State Of Kansas ~ For A Memorial Park". Description: A bronze plaque is mounted on a small granite slab in front of John Brown's Cabin at the Battlefield site. The inscription reads: "Placed - May 12, 1940 ~ By ~ Dept of Kans. 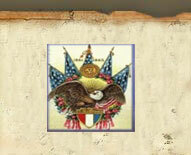 Woman's Relief Corps ~ Honoring Two Civil War Veterans ~ Commander of the Grand Army ~ T.B. Williams ~ And ~ Member of First John Brown Park Board ~ Major J.B. Remington". 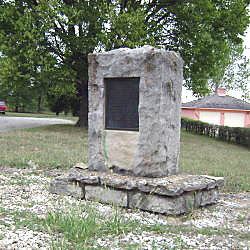 Description: A concrete marker is labeled GAR on it's base. No other information is included. 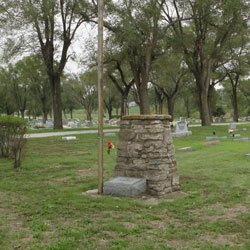 Description: A stone platform, flagpole,and small granite marker are grouped. The monument is inscribed: "Dedicated 1953 ~ To ~ Those Who Served ~ Their Country ~ By ~ Veterans Of Foreign Wars ~ Hanlin-Kelly Post No 2258"". "Frederick Brown ~ Son Of ~ Capt John Brown ~ Born ~ Dec. 21, 1836". 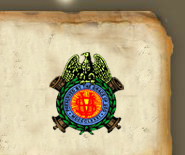 "Theron Parker Powers ~ Born ~ Oct. 1, 1831 ~ Charley Keiser". "David R. Garrison ~ Born ~ Dec. 14, 1826 ~ George W. Partridge ~ Born ~ Dec. 22, 1827". "This Inscription Is Also ~ In Commemoration Of The ~ Heroism Of ~ Capt John Brown ~ Who Commanded At The ~ Battle Of Osawatomie ~ August 30, 1856 ~ Who Died And Conquered ~ American Slavery ~ On The Scaffold At ~ Charlestown Va. ~ Dec 2, 1860". Description: A bronze plaque is mounted on a granite marker. The inscription reads: "In Memorium ~ Near This Spot Fell ~ Frederick Brown ~ Son Of Capt. John Brown. ~ He Was Killed The Morning ~ Of The Battle Of Osawatomie ~ Aug 30th 1856 By A Scout ~ Of The Advancing ~ Pro-Slavery Forces. 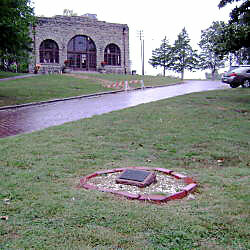 ~ Near Here Also Is The ~ Original Site Of The ~ John Brown Cabin ~ Which Is Now Located In ~ The Memorial State Park ~ Osawatomie Kansas". 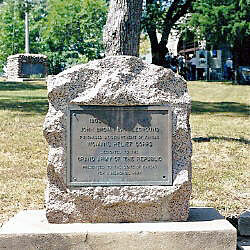 The side of the marker is engraved: "Dedicated ~ Aug 30 ~ 1933". Description: Granite spire with soldier statue on top. The statue is a civil war era soldier. The square base supporting the statue is inscribed: "Erected 1916, In Honor Of Our Countries ~ Defenders, By The School Children Of ~ Miami County And The D.O. Seller Family ~ Dedicated 1968 To Those Who Have Made The Supreme Sacrifice". A separate bronze panel is inscribed: "Miami County's Honored Dead ~ Spanish War & The Philippines (followed by names) ~ World War (followed by names) ~ Erected 1925".